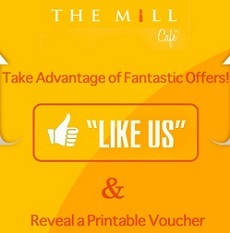 The Mill Cafe wants to reward you for being their fan! How to get the free voucher? Visit The Mill Cafe facebook page. Download and print out the voucher. Visit The Mill Cafe facebook page now! Remember to share this great offer with your friends yah! The Mill Café is a trendy all-day dining restaurant located on 1st floor, offering a variety of delicious selections from the Asian to the Mediterranean region and is specially catered to the discerning tastes for diners. Its elegant and contemporary design and use of low lighting creates a relaxing and comfortable atmosphere. Among the features of the restaurant is its modern buffet style set-up and open kitchen concept capable of accommodating 180 people with two semi private dining rooms. The restaurant offers delicious snack and hearty meal. Daily specials include delectable breakfast, lunch, dinner buffets and ala carte whilst the weekend brunch is a gourmet’s delight. Address: 160 Jalan Bukit Bintang, 55100 Kuala Lumpur, Malaysia.